Sound Effects for "Planet of the Apes"
When Weddington Productions' sound effects supervisor Richard Anderson began the task of assembling the audio elements needed for Tim Burton's production of "Planet of the Apes," he hired recordist Eric Potter to help gather new sounds for the film. 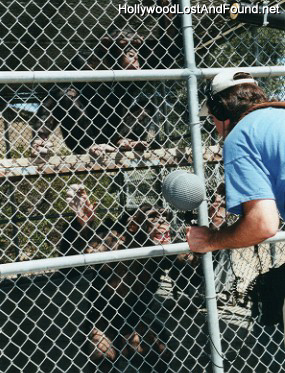 Potter and sound editor David Whittaker traveled to Steve Martin's Working Wildlife in Frazier Park, California, to record chimpanzees and other animals. Martin, who has over 30 years experience training and handling animals for film and television, worked with the sound crew to record elements that would be later used to create the vocals of some of the film's characters. Eric Potter records the chimpanzees at Steve Martin's Working Wildlife. After getting their vocalizations on DAT tape, the animal sounds were then transferred to digital sound files and cleaned-up using ProTools. Sound editor David Whittaker organized this material for the "Planet of the Apes" sound crew. 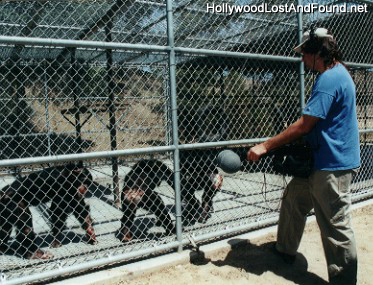 Eric Potter (left) and animal trainer Steve Martin try to coax the chimpanzees to speak up. Since apes have a limited "vocabulary," other sounds from Weddington Productions' sound effects library (including hyena and tiger recordings) were also used to add character to the creature voices in "Planet of the Apes." 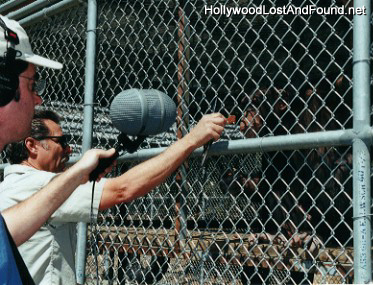 While recording sound effects for "Planet of the Apes," Eric Potter gets up close and personal with the chimpanzees at Steve Martin's Working Wildlife. After being mastered to digital sound files, sound editors Avram Gold and Curt Schulkey took this material along with other animal sounds and edited them around the dialogue of the actors such as Tim Roth and Michael Clarke Duncan who played the apes in the film. To learn more about Steve Martin's Working Wildlife, visit their website at www.WorkingWildlife.com. 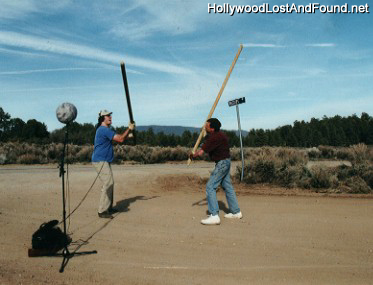 For the sounds of the ape soldier's wooden staves and other weapons, Eric Potter (left) and David Whittaker got to play with big sticks. Occasionally one has to do some silly things when working in this business. 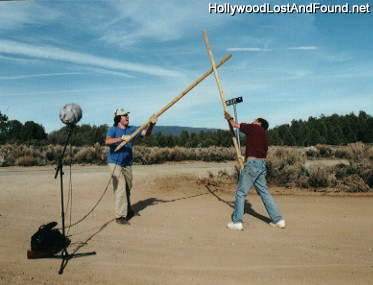 At a fairly remote location to limit the number of "audio distractions" that would ruin the recordings (such as autos or birds), Eric Potter and David Whittaker beat large pieces of wood together for the weapon sounds of the ape soldiers. These and other sounds were digitally mastered by Weddington Productions' sound effects wrangler Steve Lee for the "Planet of the Apes" sound editors.